“Fayemi signed his own on September 15, 2014, exactly a month to his leaving office, now I’m signing my own on September 14. They should keep quiet and stop crying wolf, I’m still the governor"
Former Ekiti State Governor Ayo Fayose is in the news again. But it is not because of his ongoing trial with the Economic and Financial Crime Commission this time around. 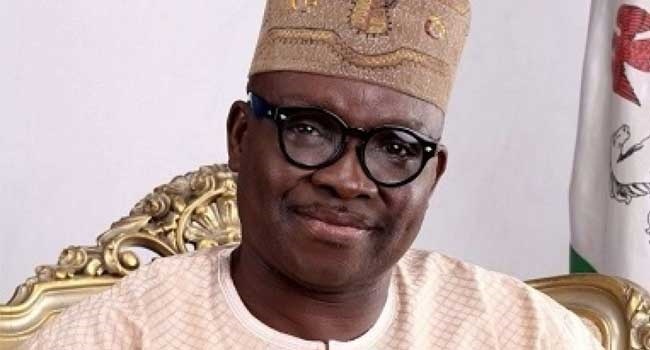 The Ekiti State House of Assembly has set up a three-man ad-hoc committee to investigate the N10bn supplementary budget passed by some members of the Assembly in the twilight of the regime of the immediate past Governor, Ayodele Fayose. The ad-hoc committee has the Deputy Speaker, Olusegun Adewumi, as chairman with Akinniyi Sunday and Fajana Ojo-Ade as members. The committee was raised at the plenary presided over by the Speaker, Adeniran Alagbada, on Tuesday. The session applauded the State Governor, Kayode Fayemi, for cancelling the education tax imposed on pupils by the Fayose government. In his contributions, the Minority Leader, Sunday Akinniyi, said the cancellation was a demonstration of the love the governor had for Ekiti people. They described the action as a step in the right direction and stressed that it would reduce the burden on parents. Recall that the Assembly had on September 13 passed the supplementary budget for Fayose’s approval. Fayose while signing the budget had said, “Fayemi signed his own on September 15, 2014, exactly a month to his leaving office, now I’m signing my own on September 14. They should keep quiet and stop crying wolf, I’m still the governor."